Also available online in a digital format. 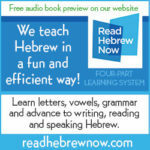 The Sarah and David Program at Read Hebrew Now (readhebrewnow.com) is a comprehensive and fun program to teach and learn Hebrew reading, designed for all ages and grades. The program includes ‘Learn the Letters,’ ‘Learn to Read and Write,’ ‘Learn Tefilah (prayer)’, ‘Prepare for Bar/Bat Mitzvah,’ and ‘Learn to Speak & Visit Israel.’ Visitors to the site, can actually open and preview each of the books in the program. Co-authors Diana Yacobi and Lily Yacobi Safrani have done an excellent job in creating workbooks, teacher’s guides, audio and visual support, and one-on-one support for truly comprehensive beginner’s instruction on teaching Hebrew reading and learning it, for synagogue, bar/bat mitzvahs, conversation, writing, reading, and scholarship. As Hebrew is used in many contexts, so this instruction, uses a variety of methods for different grades and abilities, for different contexts and comes with teacher and student resources. For example, in Part One: Aleph Bet, the letters are introduced using stories, illustrations, and very helpful descriptions such as ‘corners, curves, toes and tails’ to help the students learn the shapes of the letters. This would be great by itself, but the authors show their familiarity with real students struggling to learn the letters using other modalities, such as cute and catchy Aleph Bet Rock Song, The Aleph Bet Story, both a book and app, and they even offer a charade game in which students shape letters with their bodies! All of this is fun for the teacher as well as the student. I highly recommend this method for teaching and learning Hebrew. It will make teachers want to teach, students want to learn, and will help students retain what they have learned and motivate them to want to learn more. In Part Two, students learn to read using more engaging techniques like ‘beats and baskets’ which quickly teach students to blend and read fluently. ‘The Hebrew Reading Guide’, ‘The Torah Service Section,’ and ‘Heading to the Bimah’, to name a few. Let’s face it, Hebrew is difficult for the beginner to learn, especially since it is not just a new language, but a new alphabet as well. Teaching it requires skill, patience and helpful resources.